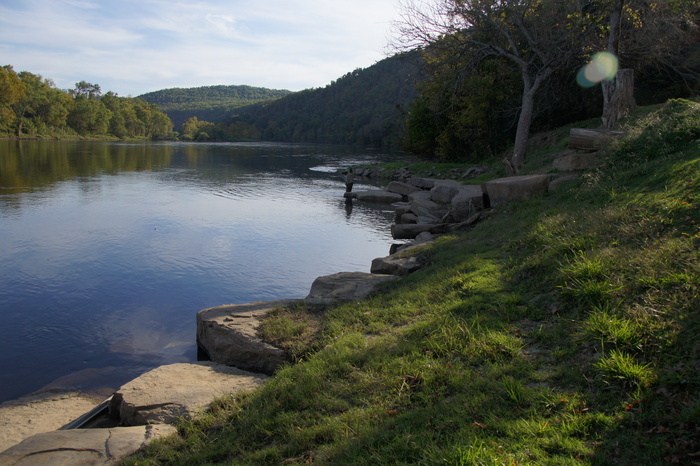 I took a short break from mushroom hunting to go fishing in Arkansas. 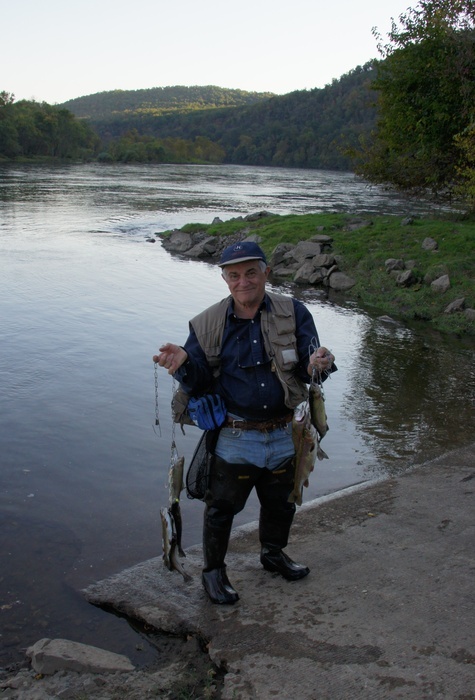 Eric, who is not much on fish or fishing, stayed on the bank to take photos. Really, I prefer it when it takes all day to catch our limit. There's nothing better than standing in the river on a hot day, watching the herons. At this spot, though, it didn't take long to start pulling them in. 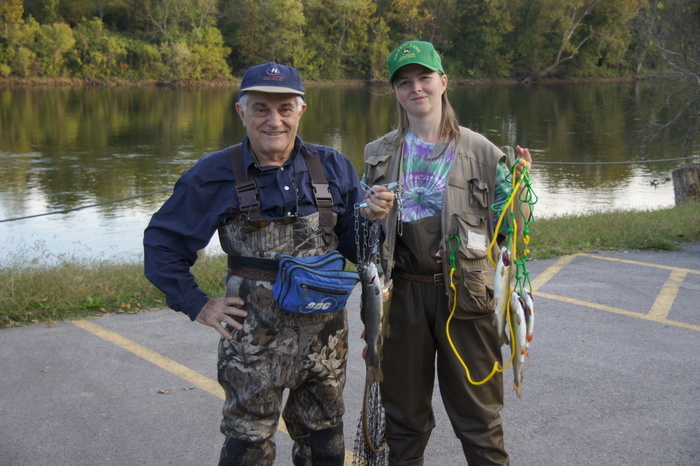 Eric's dad got another rainbow trout. It was dinner time by the time we got five, so we stopped and brought them home. I didn't find any mushrooms in Arkansas, but I did find bugs. 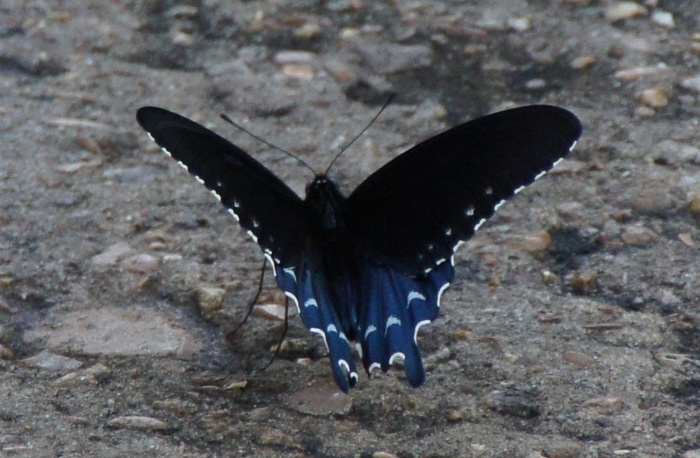 This is a Battus philenor, or pipevine swallowtail. The caterpillars eat toxic pipevine plants, and store the toxin in their tissues so that they are poisonous to birds. 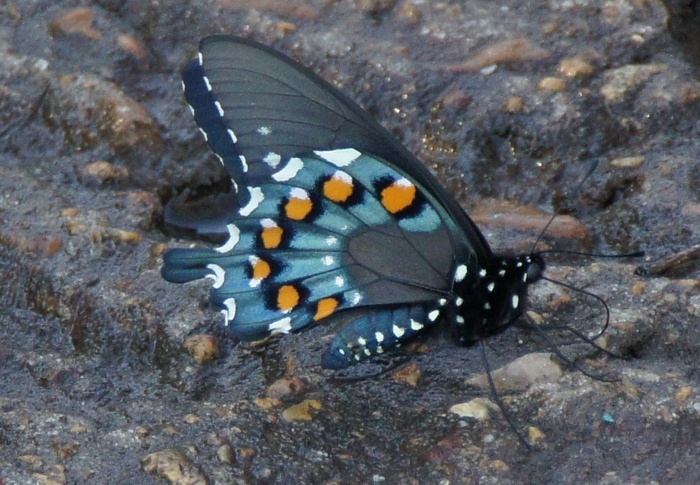 A half-dozen other butterfly species mimic their coloration, but only the pipevine has a single row of orange spots on the underside of the wing. Eric wasn't with us to take a picture, so we each took a shot holding all the fish. 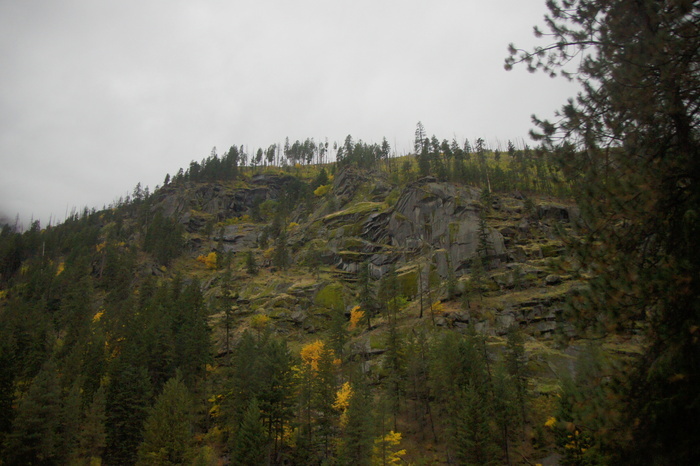 Note the big one in the front of the group to the right of the photo. 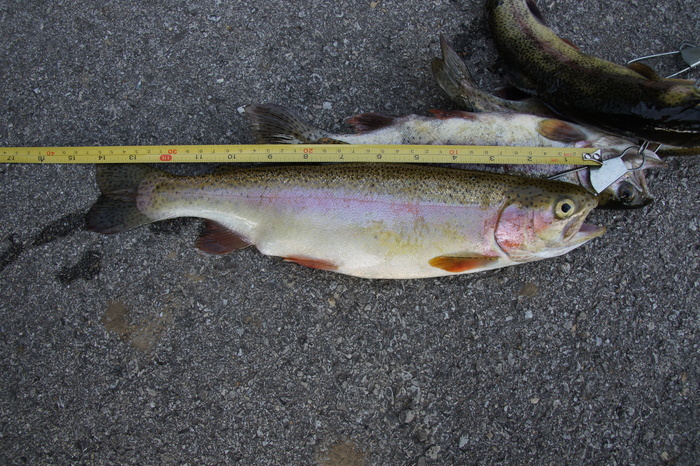 The one that didn't get away... a measuring tape proving that it really was a 15-inch rainbow trout. 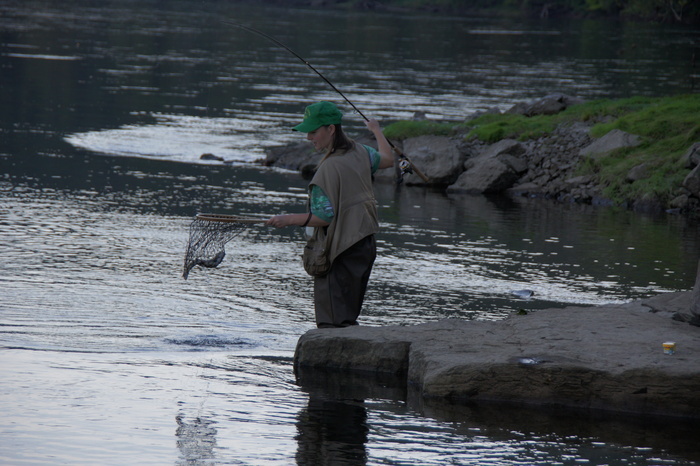 They can grow to be bigger still, but are unlikely to last that long in a river fished as much as this one. I did see another one about this size swim by to hide under the rock I was standing on. 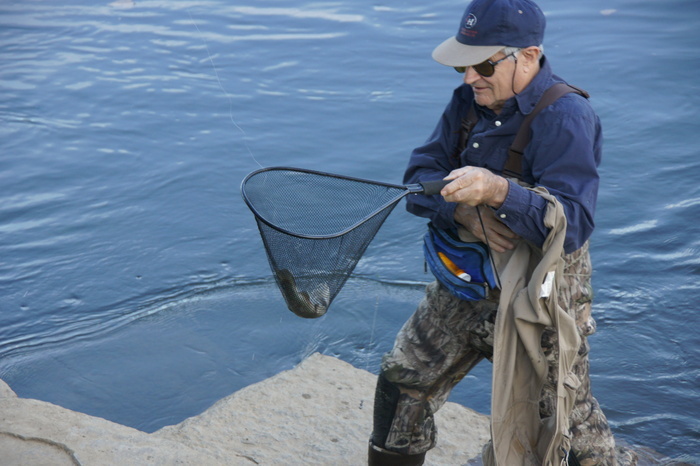 Unfortunately I was busy landing another (smaller) fish at the time, so I didn't have the chance to see if it was hungry. 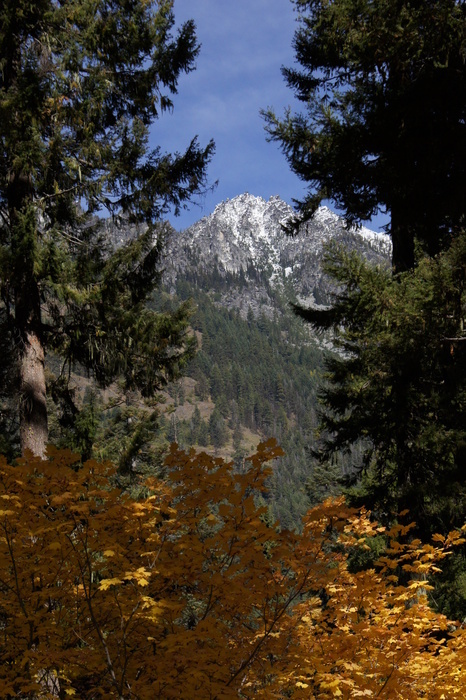 Final stop: Washington state, and back to the fungal kingdom. 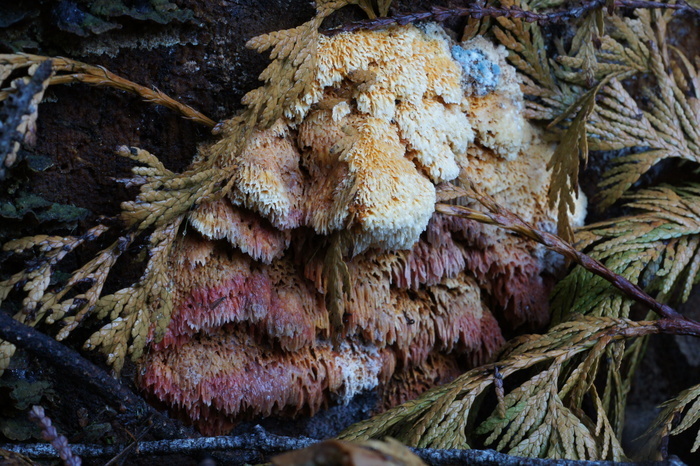 A soggy cluster of polypores slowly decomposing this stump. Note that some are classically oyster-shaped, while others are growing nearly in columns. 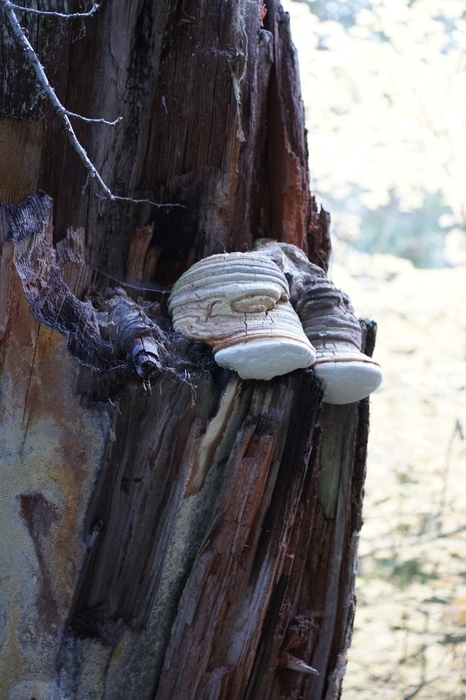 I have not been able to identify this polymorphic polypore, but I can classify this specimen as inedible... note the black mold growing on its edges. One of the most important rules for avoiding poisoning yourself when mushroom hunting is don't eat rotten food - food poisoning is far more likely than mushroom poisoning. 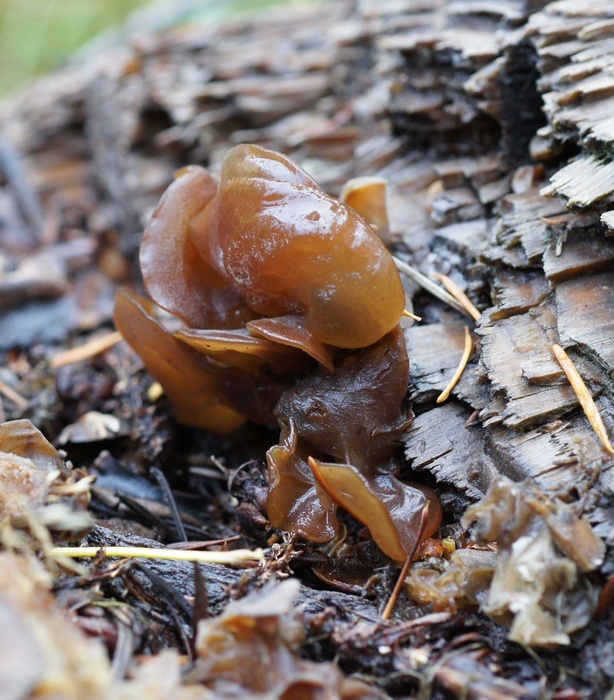 The ephemeral jelly fungus. There are several similar species of reddish-brown jellies, I have not tried to identify this one. Fuzzy plant with water droplets. 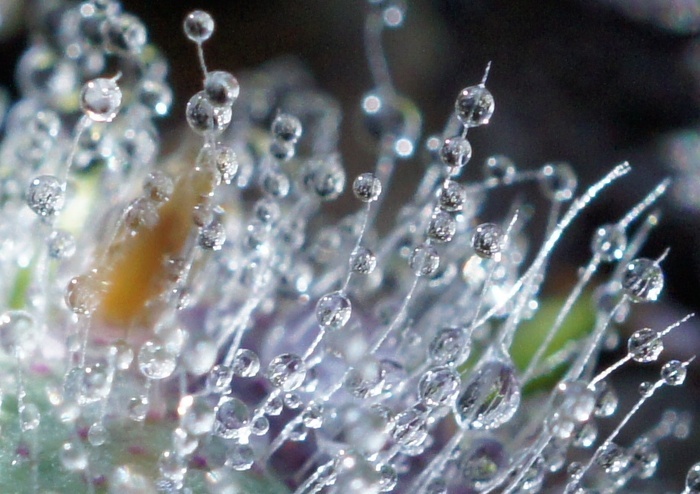 I have a soft spot for macro shots of water. I do too. This one, and the one above it, make me happy. Looking up from the ground for a moment, to appreciate the large-scale beauty of Icicle. Possibly Laricifomes (Fomitopsis) officinalis, the agarikon. 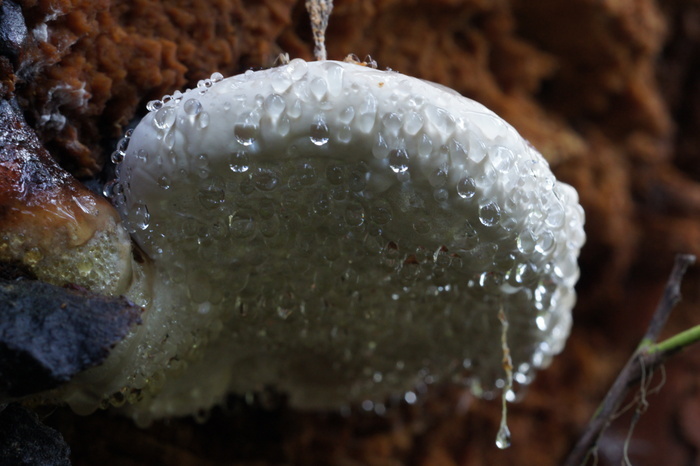 Paul Stamets points out a fungus that looks like this in his TED talk, saying that it is threatened due to its exclusive old growth forest habitat. 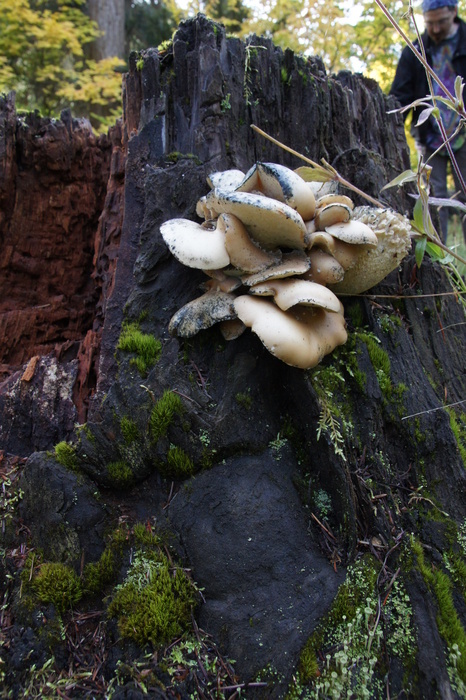 Mushrooms Demystified , however, lists Fomitopsis officinalis as one of the three common causes of brown wood rot. The photos on the web for L. (F.) officinalis seem to have at least two distinct looks, so perhaps there's more than one species or subspecies which is identified by this moniker. A photo of the underside, for the identifiers. Are more then one species in north america. Infact ive been researching all kinds of mushrooms but ive been depending on people to send me all kinds of specimens for research. I need one like on this picture. I have (12) but all have yellow undersides. Current name for this is Laricifomes Officinalis. Young polypore. 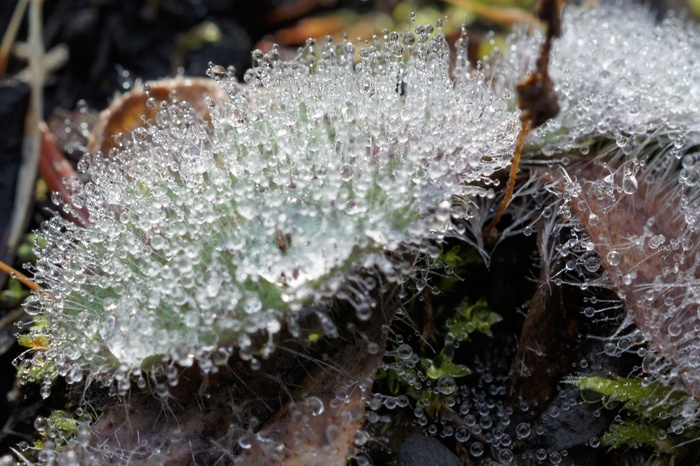 The dew-like droplets are exuded by the fungus. The internet calls it dewatering , but I have not found an explanation for why they do this. I have no guesses on the identity of this colorful wood-growing mushroom. Here's a close up of the orange fronds, though. 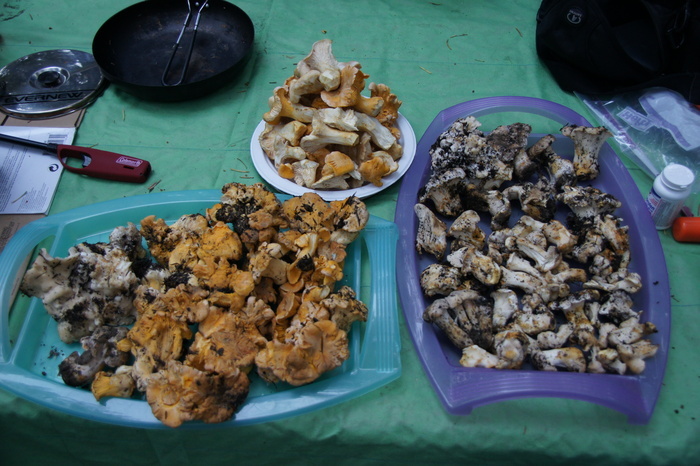 The three chanterelles growing at Icicle this year: Cantharellus cibarius, Cantharellus subalbidus, and Gomphus floccosus: the yellow, white, and scaly chanterelles. The first two are edible, the third is considered edible by some but causes stomach upset in many people - making it a poor choice for dinner in my book. The yellows don't normally have folds growing on top, but they often do when they're at Icicle. The scalies are not always as obviously different from the yellows, either... sometimes the yellows are more orange, and sometimes the scalies are more yellow. The scalies nearly always have a deep conical shape, though, where the yellows are generally more or less flat, or maybe a bit indented in the middle. 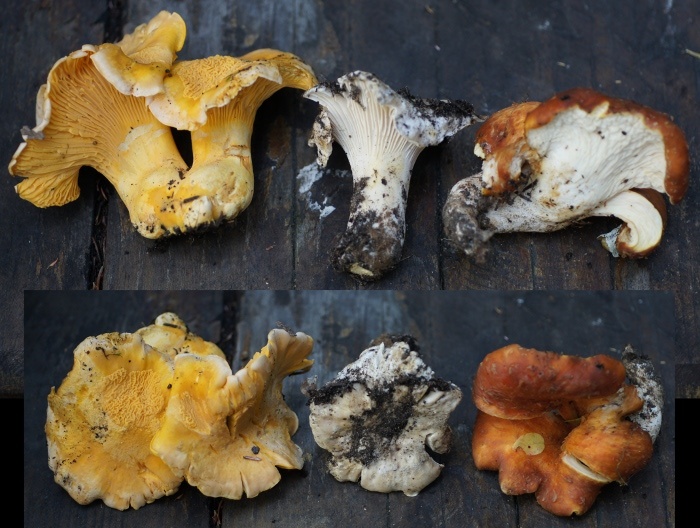 Young scalies are not always obviously indented, though, so it's better to leave very young chanterelles behind in areas with mixed yellows and scalies. Catch of the day. The pile in the middle are the ones we cleaned to cook over the campfire. Leaving Icicle for another year.